Oscar Hotel is located at Kamari area. It is a lovely two star hotel only a few steps away from the famous and unique black beach of the island where every guest can enjoy the crystal clear water of the Aegean Sea. 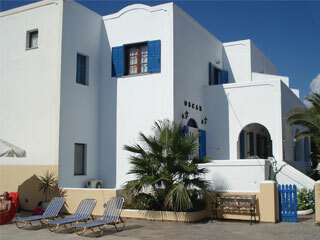 Oscar hotel holds a very good location since it is close to the beach, restaurants, cafeterias and all sorts of shops while also being near the bus stop to Fira, the capital city of the marvelous Santorini island. Guests can choose between the 12 spacious rooms offered at the Oscar that have all the standard amenities like mini bars and balconies or verandas.Oscar hotel will offer its guests every desired comfort, from a very large swimming pool to comfortable sunbeds and umbrellas and from Internet facilities to parking spaces. All you need, Oscar hotel will provide!